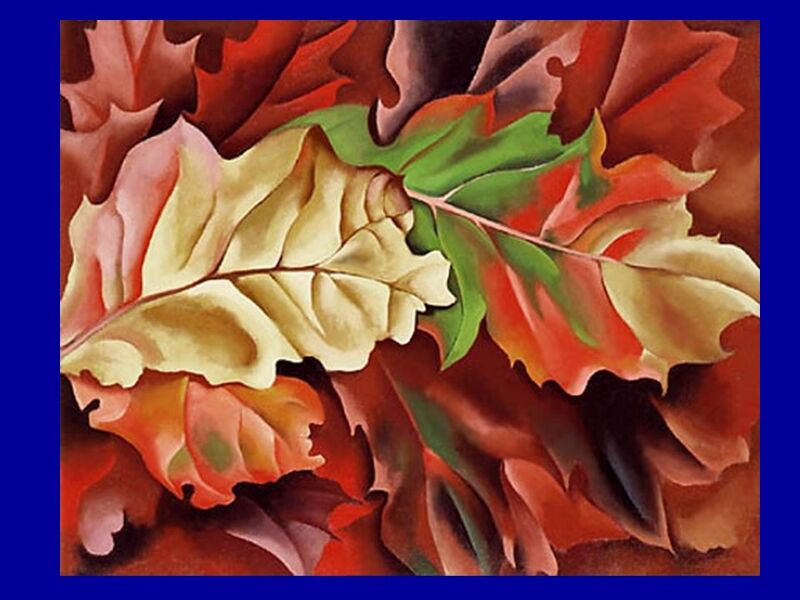 Georgia O'Keeffe [American Painter, 1887-1986]. What is the main idea (focus) of this painting? A Flower What style of art do you think this is? Abstract. 4 She did so well with her lessons that her parents encouraged Georgia to go to art college. 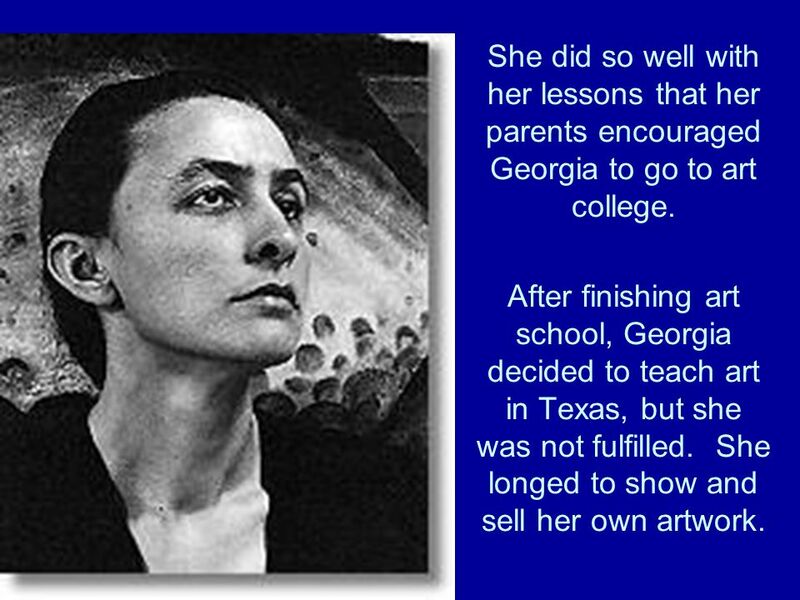 After finishing art school, Georgia decided to teach art in Texas, but she was not fulfilled. She longed to show and sell her own artwork. 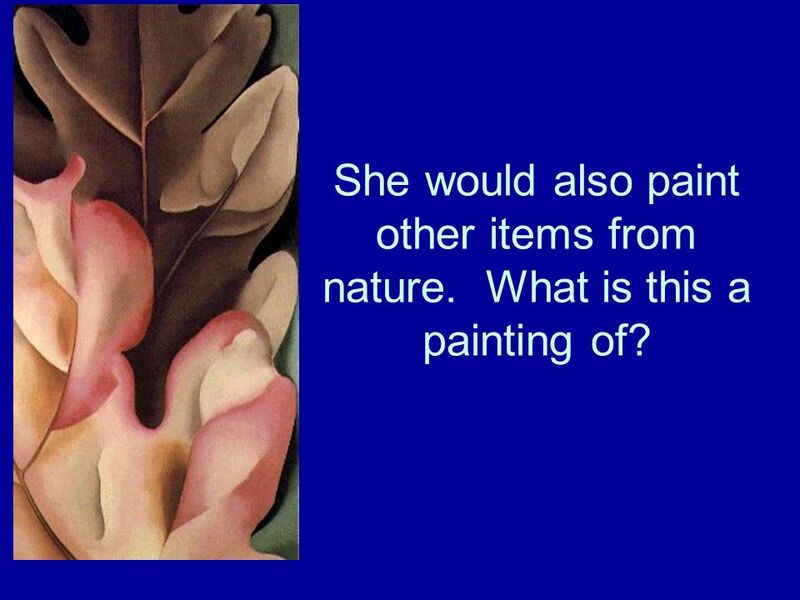 6 Why do you think she chose to paint flowers? She usually made her flowers very large. She hoped they would make people feel the same wonderful way she felt when she looked at real flowers. 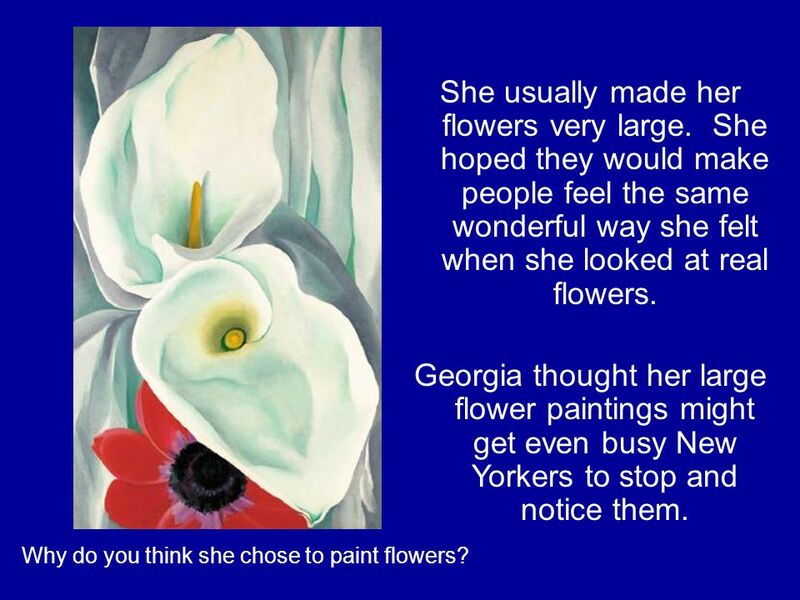 Georgia thought her large flower paintings might get even busy New Yorkers to stop and notice them. 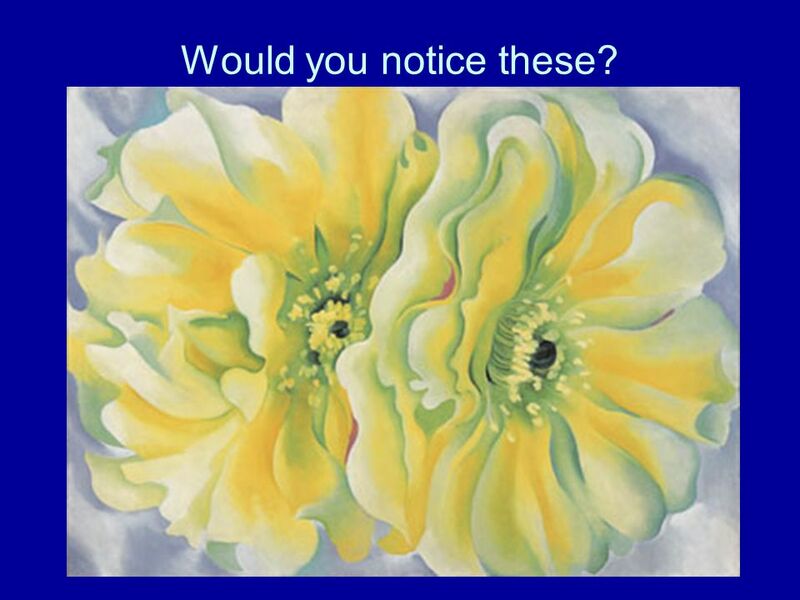 7 Would you notice these? 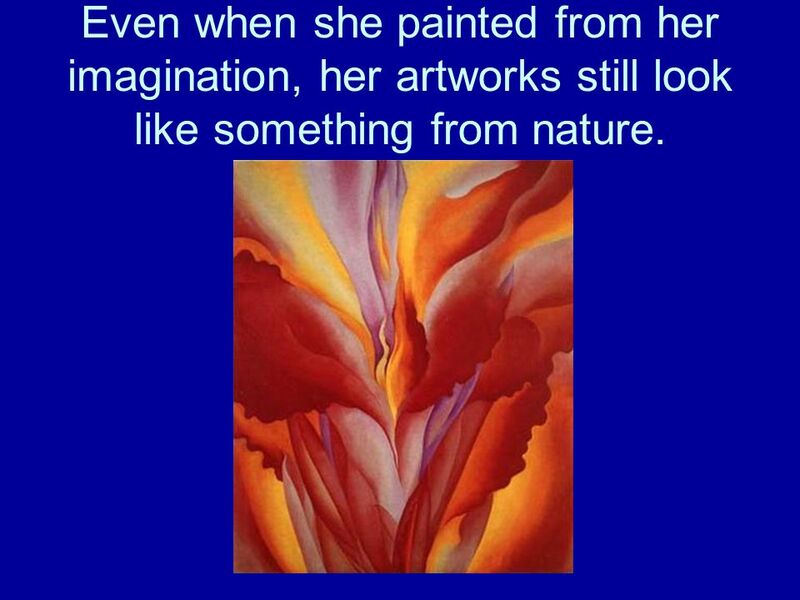 8 She would also paint other items from nature. What is this a painting of? 10 Can you tell what Georgia was looking at while she painted this picture? 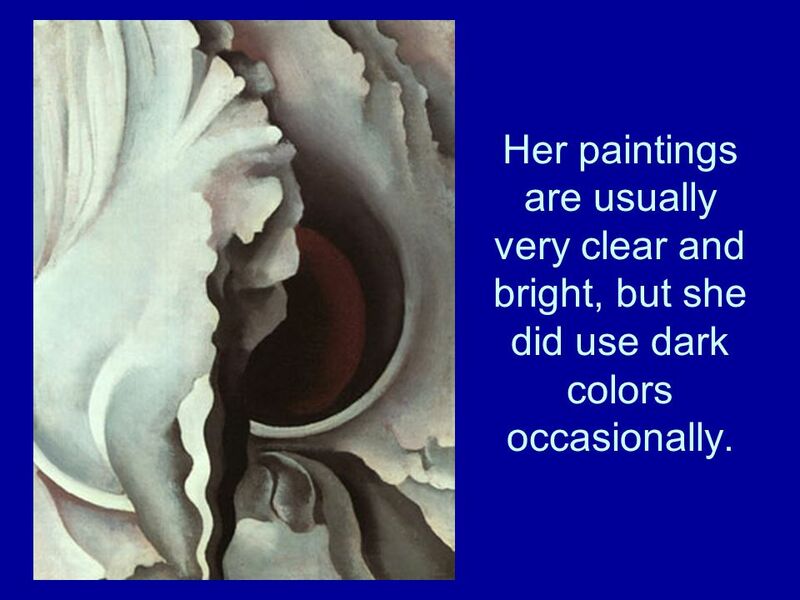 11 Her paintings are usually very clear and bright, but she did use dark colors occasionally. 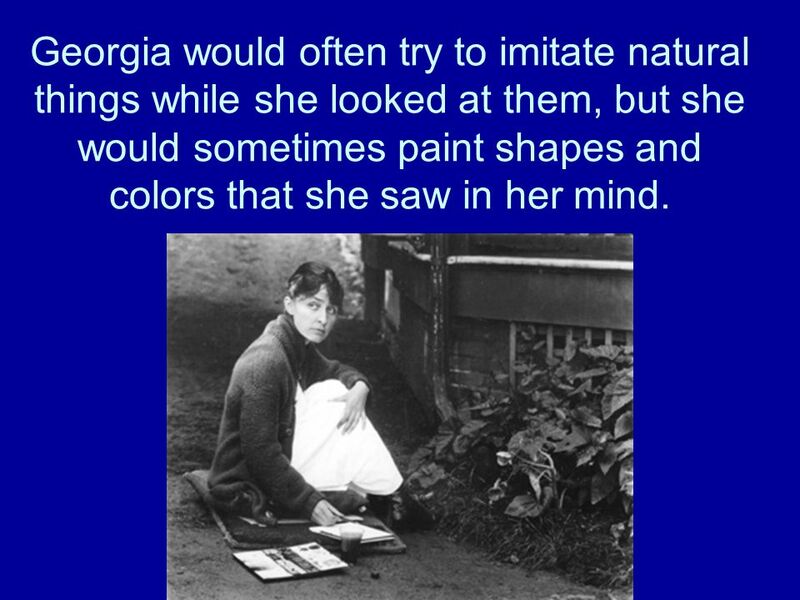 12 Georgia would often try to imitate natural things while she looked at them, but she would sometimes paint shapes and colors that she saw in her mind. 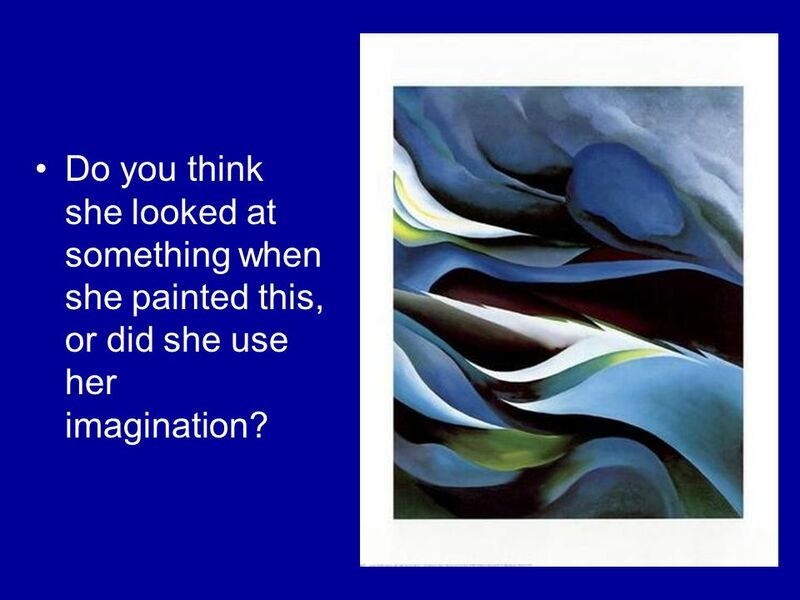 13 Do you think she looked at something when she painted this, or did she use her imagination? 14 Even when she painted from her imagination, her artworks still look like something from nature. 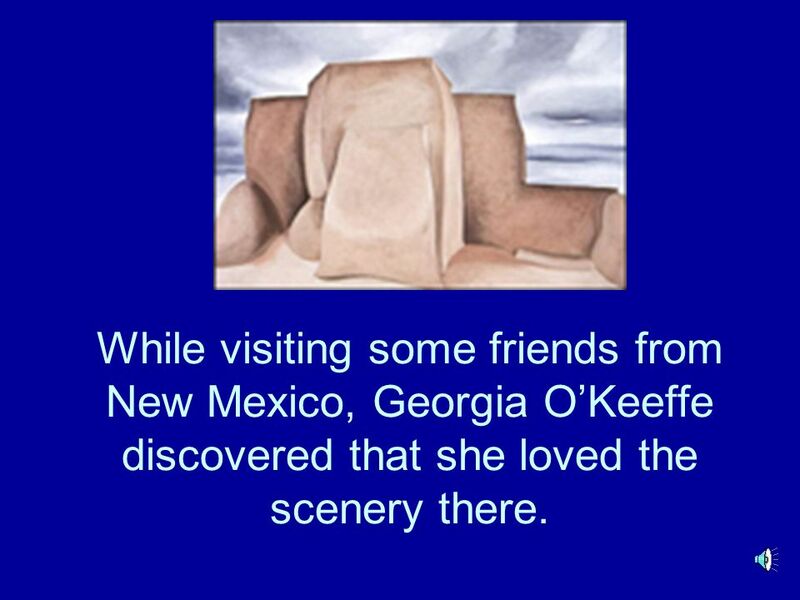 15 While visiting some friends from New Mexico, Georgia OKeeffe discovered that she loved the scenery there. 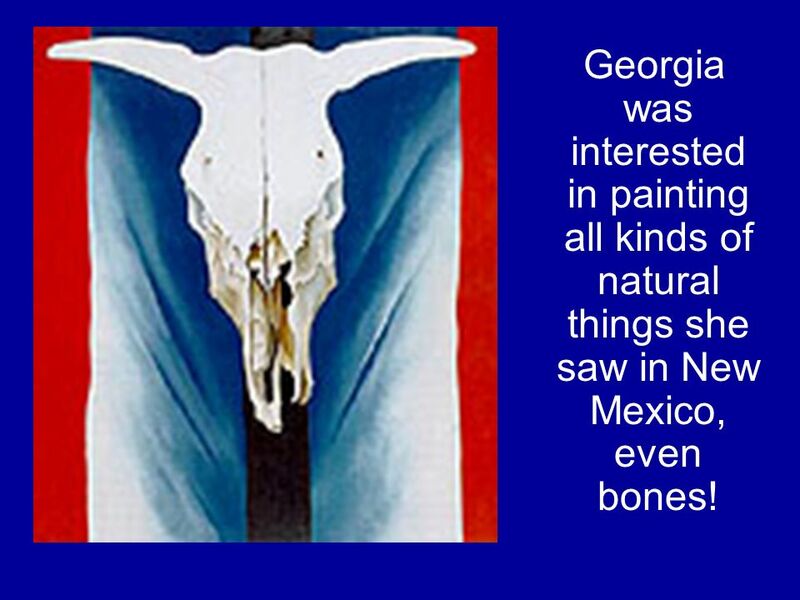 16 Georgia was interested in painting all kinds of natural things she saw in New Mexico, even bones! 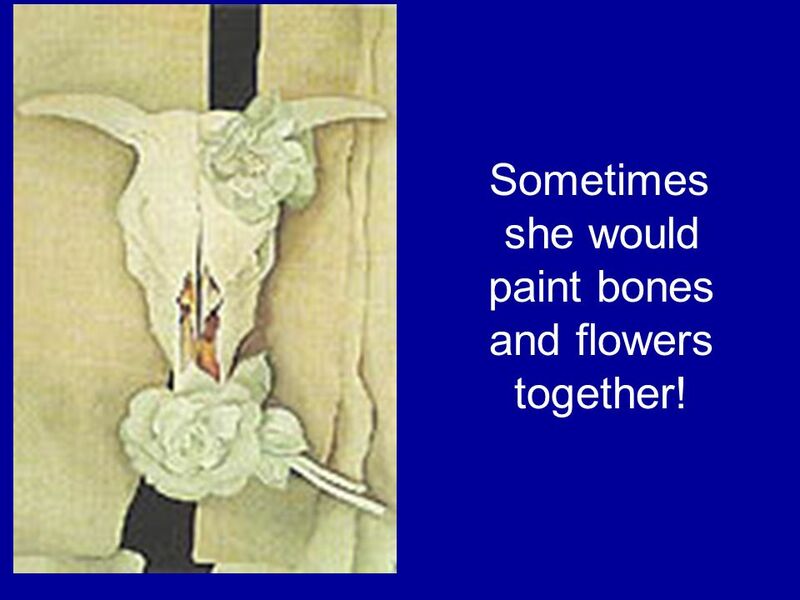 18 Sometimes she would paint bones and flowers together! 19 Georgia OKeeffes paintings can be found in museums all over our country and the world. She even has a whole museum dedicated to her. 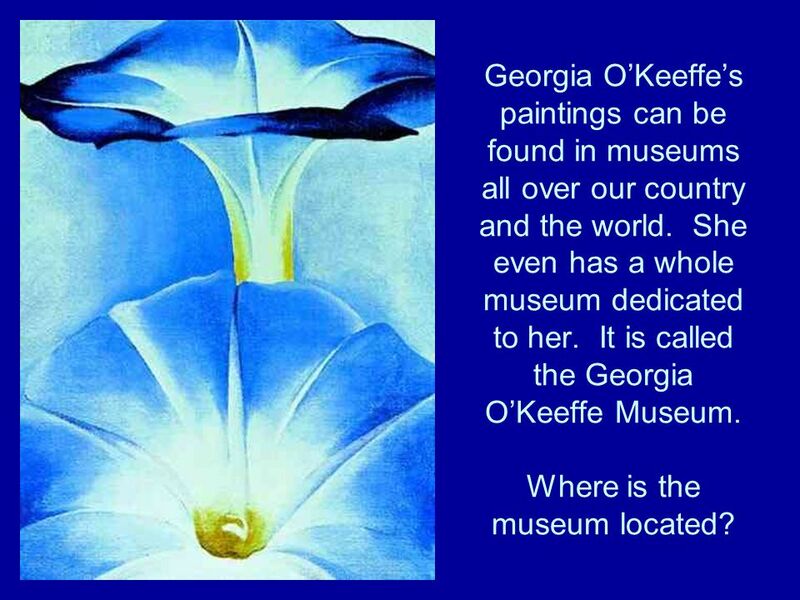 It is called the Georgia OKeeffe Museum. Where is the museum located? 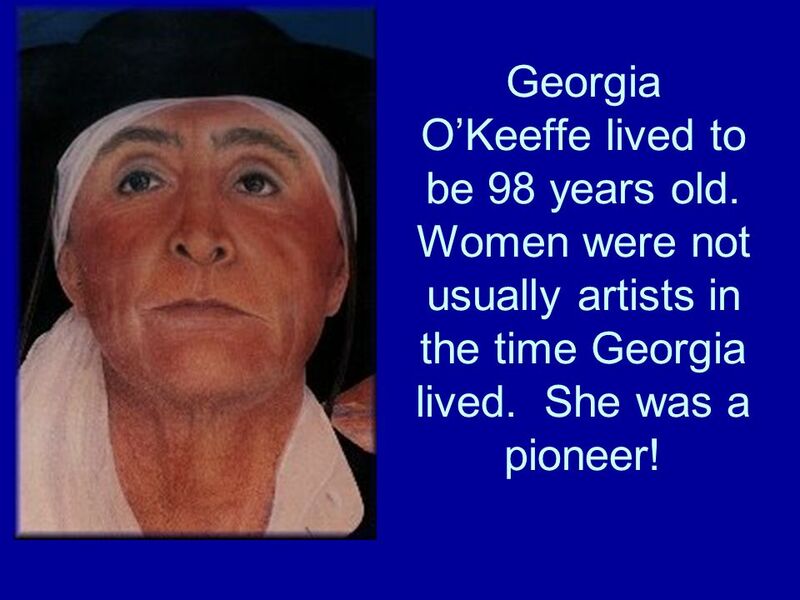 20 Georgia OKeeffe lived to be 98 years old. Women were not usually artists in the time Georgia lived. She was a pioneer! 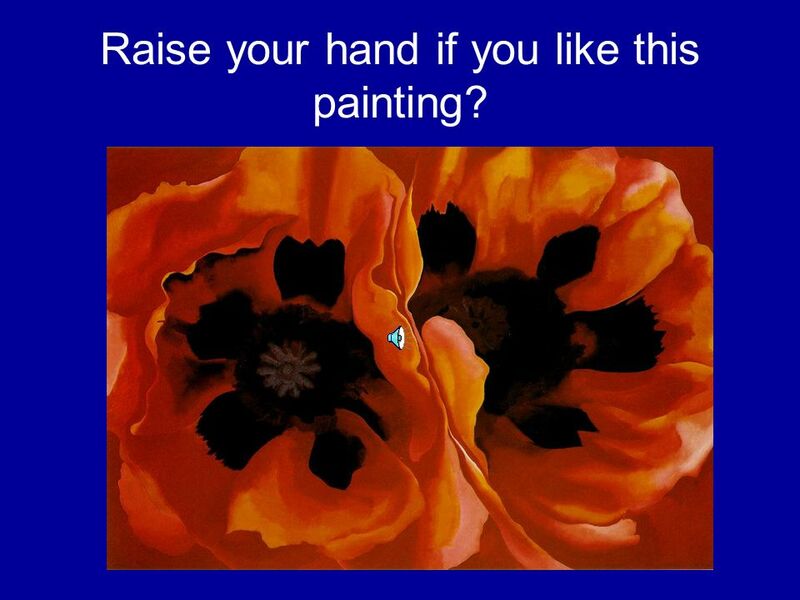 21 Raise your hand if you like this painting? 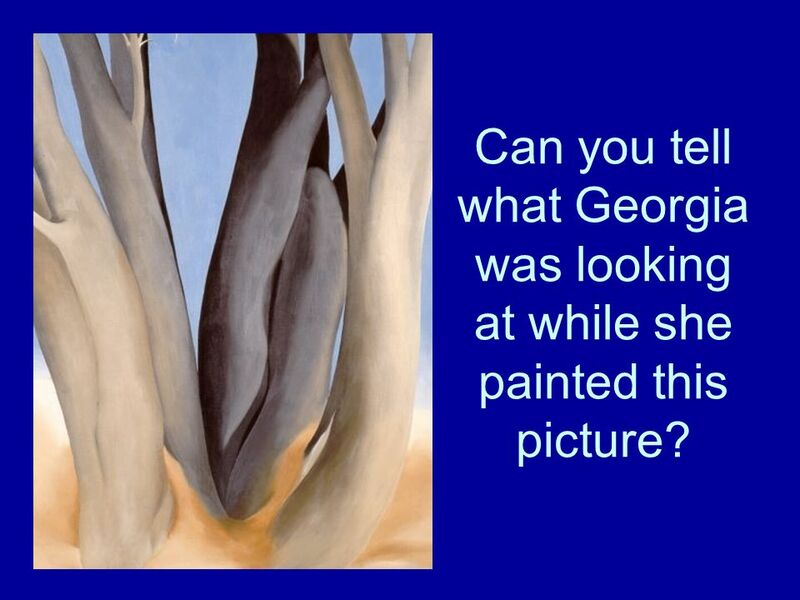 Download ppt "Georgia O'Keeffe [American Painter, 1887-1986]. What is the main idea (focus) of this painting? 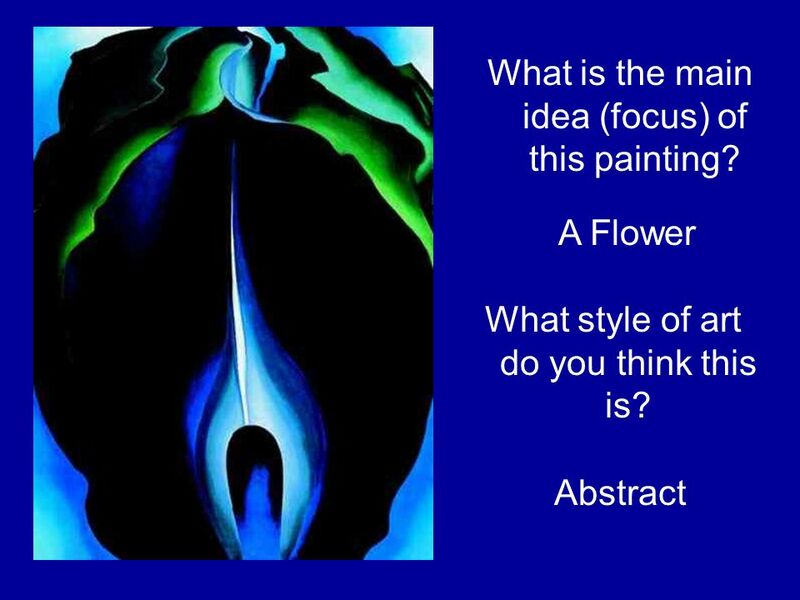 A Flower What style of art do you think this is? Abstract." Georgia OKeeffe (1887 – 1986) Painter (1887 – 1986) Painter. Georgia OKeeffe Oil Pastel Flowers. Born November 15 th 1887 in Wisconsin In 8 th grade she knew she wanted to be an artist. Flowers in the style of Georgia OKeeffe Georgia OKeeffe was an American artist who became famous for her large and colorful paintings of flowers. By Shelby Skifton!. 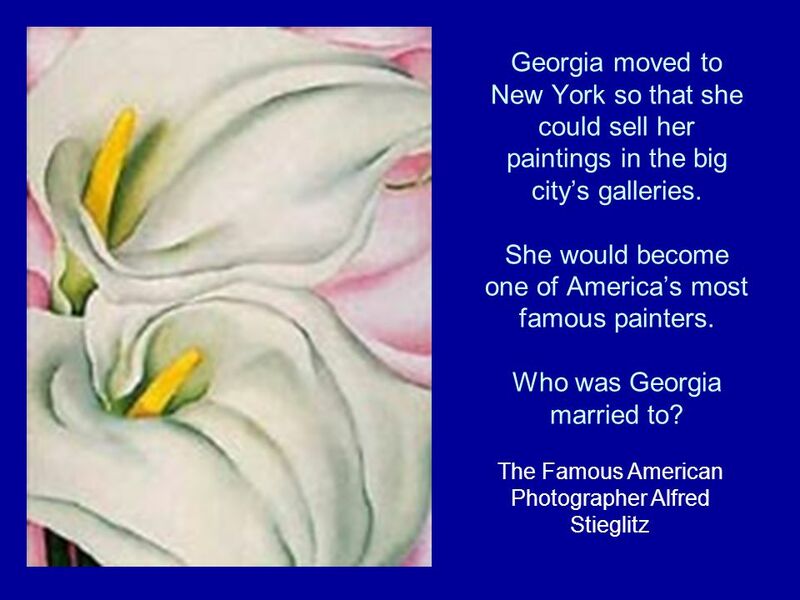 **Georgia O’Keefe is from the United States. **She was born on November 18, 1887 in Sun Prairie, Wisconsin, U.S. **She Died on March. 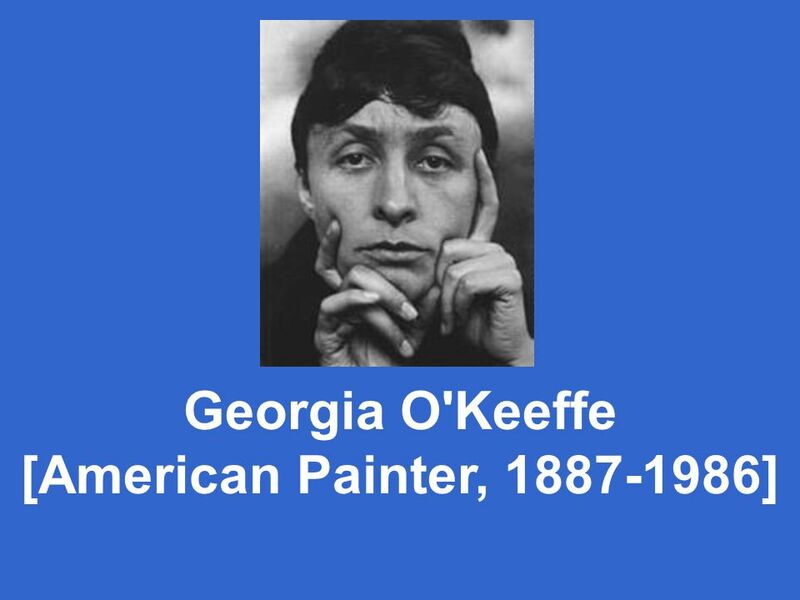 Georgia O’ Keeffe American artist; Modernist painter From the state of Wisconsin 1 st woman honored with her own exhibition at New York’s Museum. Georgia O’Keeffe Georgia O'Keeffe was born on November 15, 1887, the second of seven children, and grew up on a farm in Sun Prairie, Wisconsin. Georgia O’Keeffe  Georgia O'Keeffe was born in a farmhouse on a large dairy farm outside of Sun Prairie, Wisconsin on November 15, 1887. Frida Kahlo SELF-PORTRAITS. SELF-PORTRAITS FRIDA KAHLO How many of you know the term “selfie”? What is “selfie” short for? A “selfie” is short for a self-portrait. DO NOW: Do now text goes here. Georgia O’Keeffe. Henri Matisse By Denise Jackson. 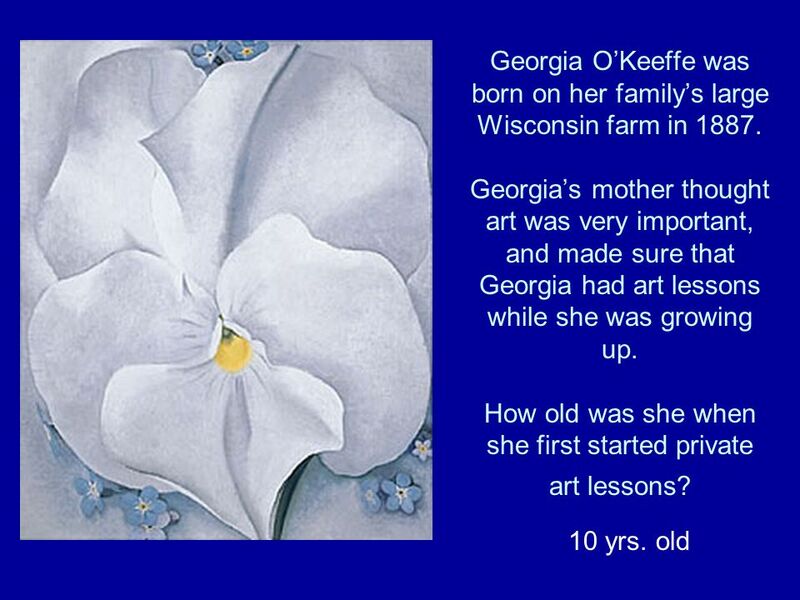 Intro to Georgia O'Keeffe. 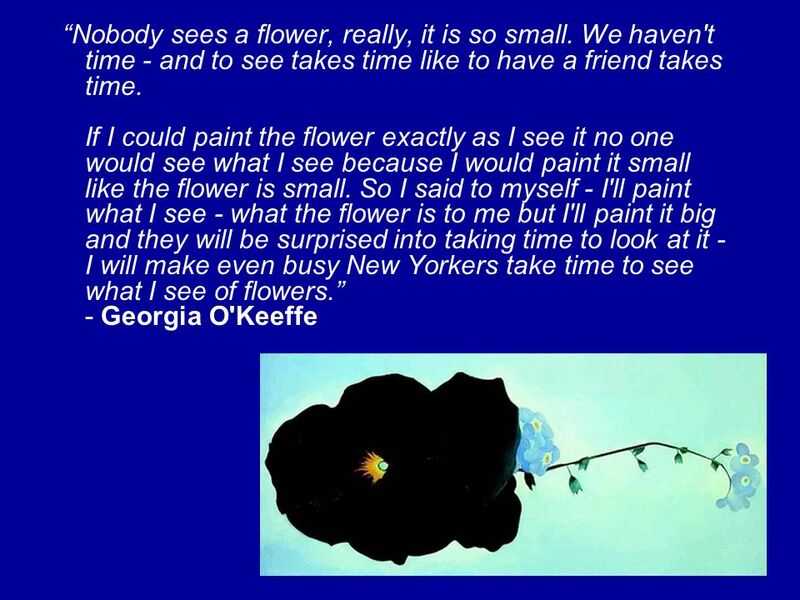 Georgia O’Keeffe An American artist born in Wisconsin -Loved to go outside and observe nature starting from when. 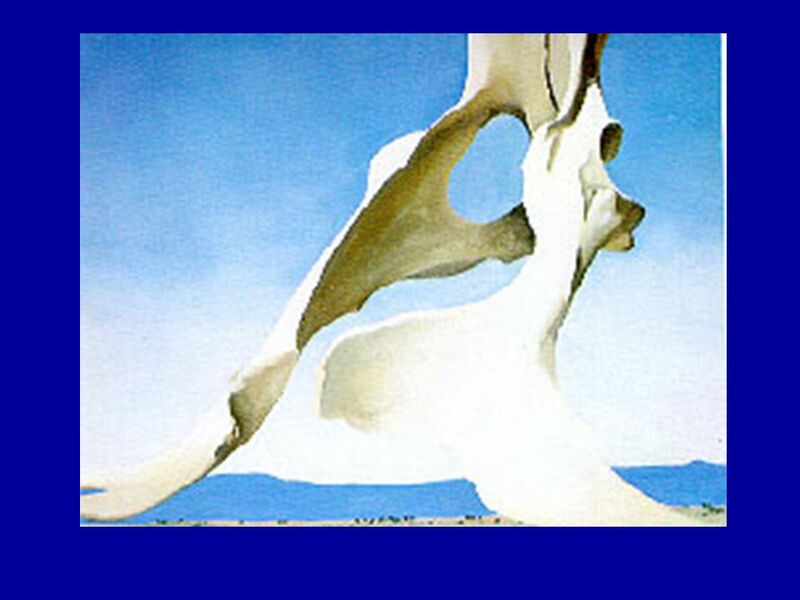 Georgia O’Keeffe Art Masterpiece. Biography She was born in 1887 on a Wisconsin farm. She was born around the same time that the telephone and light bulb. Georgia O’Keeffe By Amari SantoyoPeriod 6. Start and End Georgia O’Keeffe was born in 1887 on a dairy farm Born in Sun Prairie, Wisconsin, November 15. Crazy Cactus Georgia O’Keefe and the Elements of ArtElements of Art.